For so many years I’ve been afraid. Afraid to take a chance, to stick my neck out, to be who I am meant to be. At the beginning of 2013, I had the idea for a series of Masterclasses on a range of topics, targeted at mums in business. I kept putting them off and putting them off, until eventually I chickened out completely. I told myself that it was too hard to get bums on seats for events in Ballarat. I was afraid to fail. I didn’t want to put myself out there and fail miserably in front of the whole town. But really, I just didn’t want to stand out. We have such a tendency in this country to cut down Tall Poppies. Anyone who dares to be different, who dares to stand out, who dares to succeed, becomes a target. We find reasons to bring them down, ridicule them and enjoy seeing them fall. Yes, WE. I’ve been part of the crowd. I was secretly thrilled when somebody failed, just because they chose to do something different. Somewhere in the last six months though, I managed to find my big girl pants and have started standing up and daring to be awesome. Not that it’s always worked. But giving it a go and failing is better than not trying at all. Half way through last year, I had the idea to run a “Blogging for Beginners” workshop here in town. I booked a venue, I printed flyers, I advertised on Facebook. And I got 1, yes 1, enrollment. So I cancelled, because a workshop is not really a workshop without at least 5 participants. And, yes, I was disappointed, yes, I was angry, but I wasn’t embarrassed. Nobody laughed at me. My friends commiserated with me about the whole “Ballarat thing”, never suggesting that I wasn’t good enough, that I didn’t know my stuff, or that I was stupid to even try. I don’t know if anyone took any joy in my failure, but if they did, I never found out. I was proud of myself that I dared to do something, rather than not even try. I read somewhere that a successful person is someone that has failed again and again, but kept on trying, while a failure is someone that has never tried at all. This year I am going to be trying lots of things. Some will work and some won’t. I’m no longer afraid of what others will think. And honestly, they probably won’t think about me at all. The people in my support network will cheer me on regardless of how I go, will commiserate with me when things don’t go well and celebrate when things do work. Everyone else doesn’t matter. So if you’ve been worrying about what others might think about your success or failure, stop! You owe it to the world to give your best performance, to show off your brilliance and shine. Sure, some people will find that reason enough to pull you down, but don’t let them. Be committed to your success, to the gift that you bring to the world and keep on trying. Try idea after idea and don’t give up. We are not all meant to be sheep, identical in our gifts and outlooks. We are here to stand out, to show off our brilliance and to use it to make the world a better place. 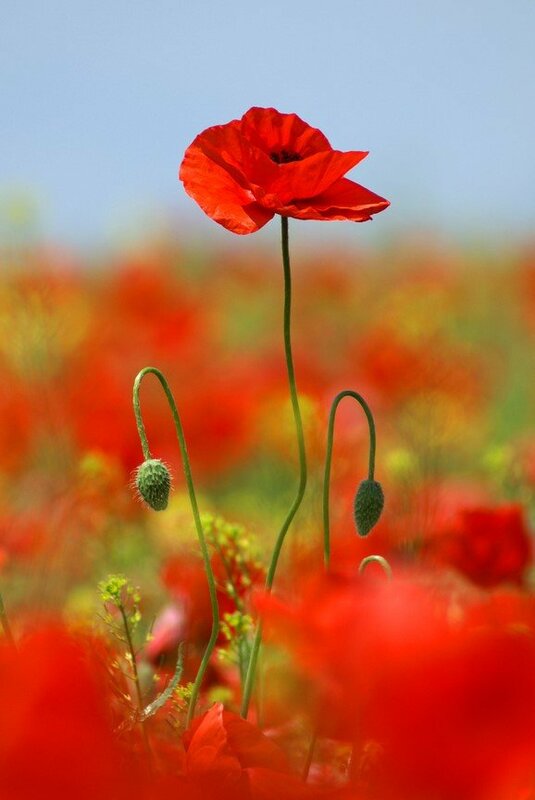 So I dare you to be a Tall Poppy. How will YOU stand out from the crowd? What will you do next? A shrinking violet here. It isn’t (I don’t think) fear of ridicule, but the strong belief I have nothing to offer. Good luck with your plunges into the deep end. You’ll never know if you don’t try. As I get older I’m less afraid of making an idiot of myself, so kudos to you for giving it a go. Exactly. It’s getting easier and easier with the years and even months. I never thought I would be running my own business, but now I can’t imagine doing anything else.